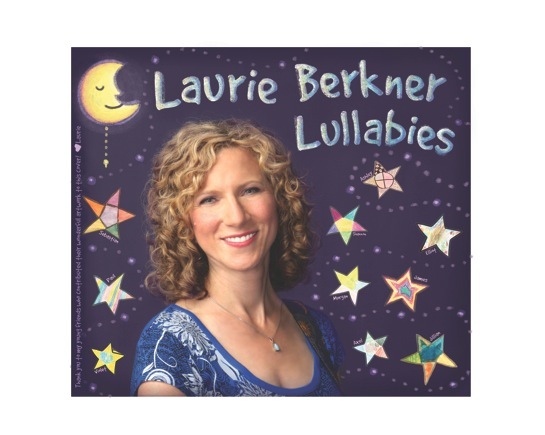 What’s on Laurie Berkner’s iPod? 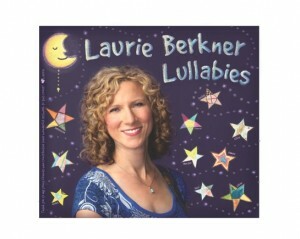 Today, we let Laurie Berkner tell us what’s on her iPod. I was looking forward to writing this piece both because I was really curious about what would come up. As a songwriter I use my mp3 player as a work tool as much as I do for pleasure, so an inordinate amount of the music on there is either written or sung by me – or both. (The ridiculous number of times that I have had to purchase my own songs from itunes just to remember a part or play it for someone else, has taught me that I should always have access to my music). How many of my own songs would come up? And would there be any other little gems thrown in? I pressed play. Not all my songs, but still a healthy dose. And phew, yes, a couple of gems. Hurray! What a great start. I just requested this song at get-together a few nights ago, where a friend of mine was playing piano, and I had been enjoying reliving its greatness. This is the version I know best (though he said his favorite was one by Willie Nelson that I’d like to check out). Louis Armstrong is just so fun to listen to and always sounds as though he is having a great time (particularly in this live version). I have two really strong associations with this song, 1)My brother singing it to us at our wedding – very sweet and very moving, and 2)Lily Tomlin and Steve Martin dancing to it at the end of the movie “All of Me” – one of my favorite movie moments. That’s actually how I originally got hooked on the song! Ah perfect! The first track of mine to come up was not one that I wrote or even played guitar on! In 2008 I released an album called Rocketship Run. I covered this amazing tune as the last song. It’s one I’ve always loved (especially when Frank Sinatra sings it) and that I often sang to my daughter, Lucy, so it had a special place in my heart. In fact, I was inspired to record this version of it because I found myself singing it to her all the time at home during the year that I made the album. At first though, I had trouble finding the right feel for the guitar part. Luckily, a great singer/songwriter/guitarist named James Maddock happened to also be working at the same studio I was. He played along to a rough vocal track that I had already laid down, and I loved what he did. I was very fortunate that he agreed to play on the recording, and the song finally came together in a way that I was really happy with. 3) Helplessly Hoping by Stephen Stills, performed by Crosby Stills and Nash. I was introduced to CSN (and sometimes Y) in college. For years they were some of my favorite musicians and I covered a lot of their songs. At that time I used to perform with other guitar players and singers at local bars, restaurants and coffeehouses, and we’d sing a lot of songs from the 60’s and 70’s. This song was a particular favorite of mine because the close harmonies are really great. They can make it really challenging to do live, but when we would get them right it was so satisfying! Just listening to this song now reminds me of those friends and those early days of going out and performing music. Last year I tried something new. 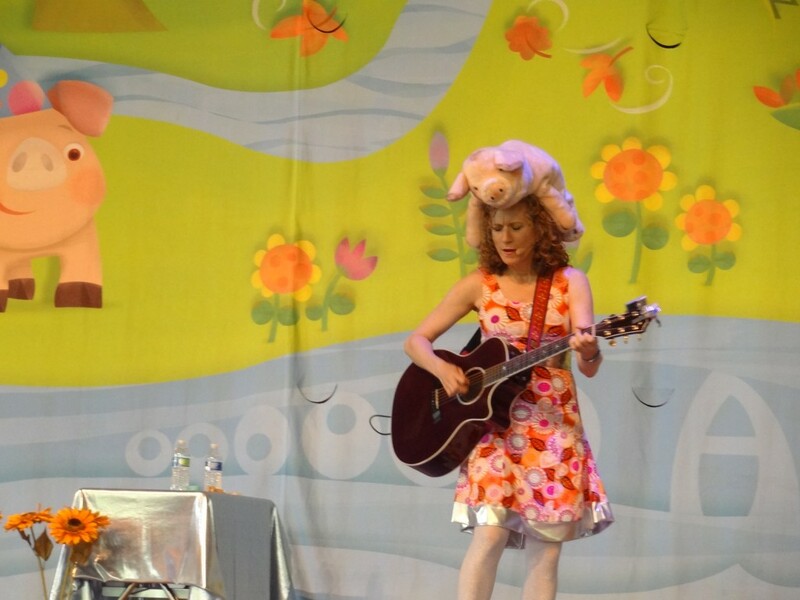 I wrote the music to an off-broadway family musical called Wanda’s Monster (based on a children’s book of the same name by Eileen Spinelli). Barbara Zinn-Kreiger, who founded the organization Making Books Sing, asked me to collaborate with her (she wrote the script) and I was so happy with how it came out! 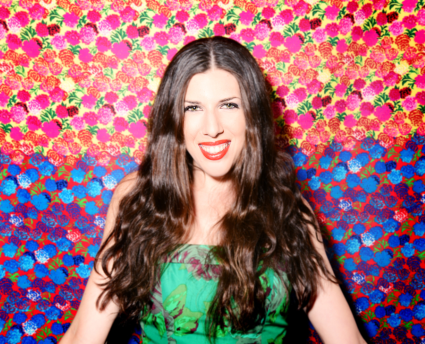 When I was a kid I dreamed of becoming a musical theater star on Broadway – but getting to write my own music for a show turned out to be even better. The biggest surprise for me was finding out that I could even do it! After many years of writing kids songs for just myself to sing, I wasn’t sure I would be able to come up with music that worked. It was a whole different experience to create words and music for other people to sing, and to have the songs I wrote actually help move a plot along. The musical is about a girl named Wanda (Laura Hankin) who has a monster (James Ortiz) in her closet that she is afraid of at first, and ultimately befriends. Toward the end of the story Monster has to find a new closet to live in (those are the “monster rules” that monsters live by) and the song is when they are saying good-bye. (But don’t worry, we soon find out that he only has to move on to her cousin Ruthie’s closet, so they do get to see each other again.) The actors who sang on the track, Laura and James, did an incredible job of bringing this song to life. You can find Laurie out touring this summer (we saw her this weekend and she was wonderful) and/or if you haven’t picked up her Lullabies record, I suggest you do. The duets with Brady Rymer are lovely and the remakes of some older tunes are well worth the investment. 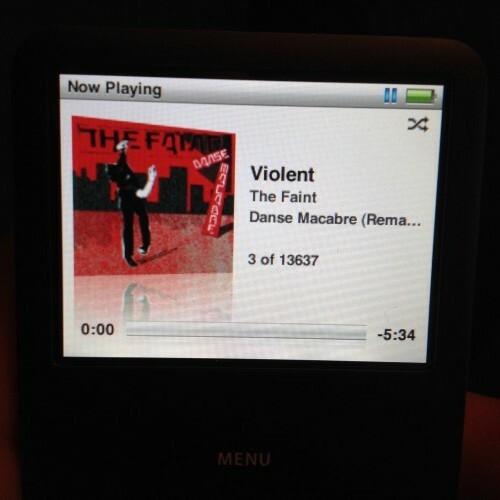 This entry was posted in Dadnabbit, Dads Writing About Kindie Culture, Uncategorized, Whats on your ipod on June 16, 2014 by Dan Walsh. What is on my iPod? Welcome to a new feature that should be a lot of fun. 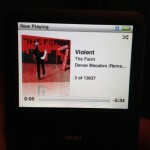 It’s a tweak on The Friday Five from our good friend Michael Parr over at Popdose.com. 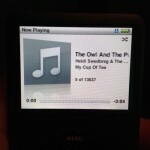 It’s pretty simple – have a kindie artist hit the shuffle button on their ipod, and tell us what comes up. Not a playlist, a shuffle of their entire collection of songs. The songs that pop up could be good or could be filled with sadness and regret. No skipping is allowed, no matter how awful the song. 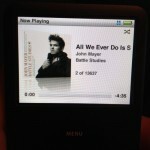 In fairness to the artists who will share their shuffled songs, I will share my 5 songs to set the bar. Low. 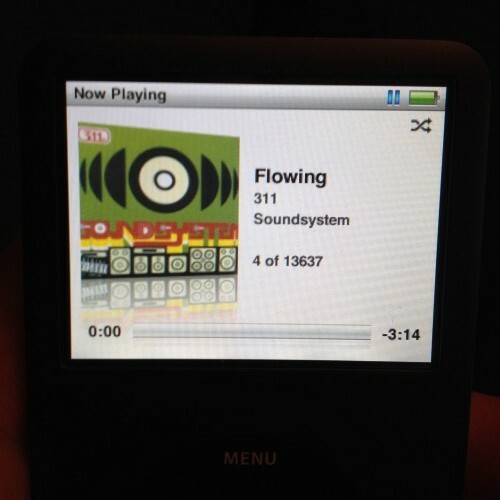 Dan Walsh’s iPod – 13,637 songs, 2,842 albums, 34.2 days of music. 1. Imagination Movers – Good Morning Sunshine. This was their first post-Disney release. I had no idea they even existed until they were no longer on Disney. 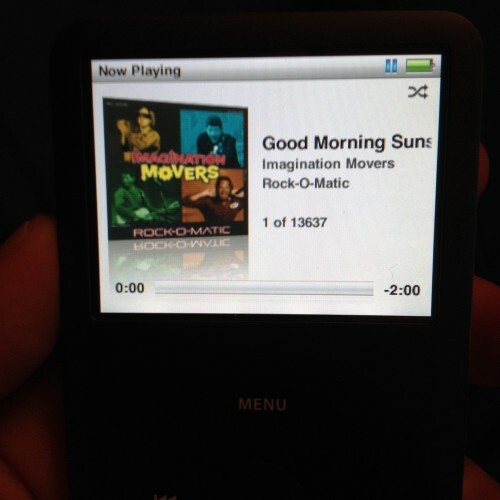 So their Rock-O-Matic record was my first introduction to the band. It’s not a bad record. It’s not a great record. We pick and choose a couple tracks from this album for playlists. This song is a simple sweet acoustic track, with wonderful harmonies. 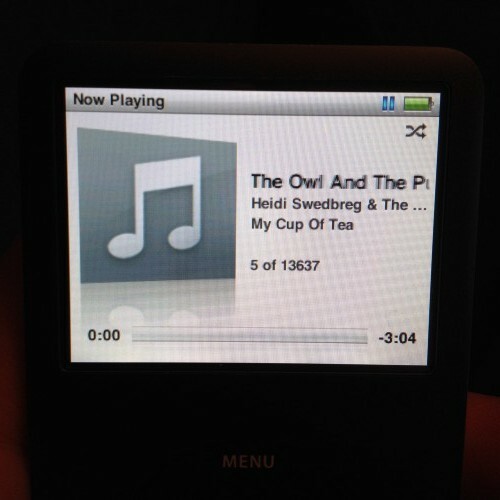 And this is what happens when you import your wife’s music (I love you sweetie, but no on this one). I don’t dislike John Mayer. He’s a decent guitar player and song writer, but he just seems like a giant douchebag. Fair or not, I usually just skip over any of his songs. I tried to play nice, but I skipped over this song at the :54 second mark. Haling from my hometown on Omaha, Danse Macabre released on Saddle Creek Records in 2001 was a game changer for me. Electronic beats dropped over compelling lyrics, as a single, geek I immediately connected to this record. I would never skip over a track from this record. Easily one of my Top 10 records of all time. Being from my hometown helps. Also from my hometown, one would think “Hahahahaha, I bet Dan regrets this one” but I don’t. No really, I don’t. I get a ton of grief for still liking these guys. Sure, I get bored and skip over some of their rap heavy tracks, but a straight ahead rocker like ‘Flowing’ never get old. At least for me it doesn’t. It’s currently on my running playlist. I also had a fun interview with the bass player back in March. Whew. Finally a true kindie artist. Was getting worried not a single one would show up. From her incredibly eclectic and joyful, My Cup Of Tea record. One of the quieter tunes from the album, but one that continually gets played in our household. And frankly, this album should be played in your household continually too. So stay tuned, in the coming days/weeks/months we’ll find out what songs came up from artists 23 Skidoo, Joanie Leeds, Lucky Diaz, and many more. 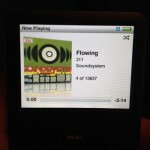 This entry was posted in Music, Uncategorized, Whats on your ipod and tagged 311, Heidi Swedberg, Imagination Movers, John Mayer, The Faint on May 13, 2014 by Dan Walsh.